A Postcard from Afthonia is the sort of game that lingers with you, a reminder of what’s important in life, and what you need to do with it when you have it. As you play A Postcard From Afthonia, take a minute to read through the descriptions of mushrooms, trees, and even rocks in each scene. You’ll find a breadth of tones and topics that’ll make you laugh as much other parts of the game make you think. I had missed the amazing sense of wonder Jonas and Verena Kyratzes have poured into every locale, the giggling at dozens of little jokes hidden behind mushrooms and flowers, the clicking on every tiny detail, the exquisite writing, the wonderfully surreal characters, the glorious puns, the richness of ideas and that deep sense of hope and beauty. A snapshot from a delightful place I’ve seen. My time there was a wonderful experience full of humor, simple joys, and a surprising depth that never forced itself upon me. The style is reminiscent of a fairy-tale storybook, matching the tone of the adventure perfectly. Ultimately, APFA, like all the other stories of the Land of Dreams, stands out because of the love that its creators put into those worlds, those stories, those drawings and those songs. It’s something felt throughout, hard to pinpoint in one feature in particular because it informs everything. Die von Verena Kyratzes handgezeichneten Figuren und Szenenbilder sowie die unverwechselbare Musik von Chris Cristodoulou gewährleisten die perfekte Präsentation dieser digitalen Ansichtskarte. A Postcard From Afthonia is a short excursion to the Isle of the Sun via the means of a magical portal. Said portal connects to events that take place after The Sea Will Claim Everything, but can be nevertheless be used by someone who has not taken that journey yet. Exactly the same game as above. Audio commentary by the writer/designer. Three Memories: Henry Trollweather reminisces about growing up on the Isle of the Sun. Bold letters to attract your attention. 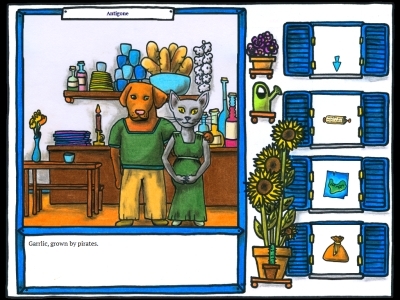 A Postcard From Afthonia – Special Edition (Jonas & Verena Kyratzes) | Buy Some Indie Games!